An easily assimilated diet promoting improved health, growth and fertility. An excellent choice when superior digestibility is desirable or metabolism is slowing. Hikari® Wheat-Germ Formula is a highly digestible, daily diet, for feeding Koi and other pond fish in cooler water temperatures. The use of the inner most portion of the wheat germ kernel with added vitamins and minerals offers higher levels of nutrient package your koi can readily utilize to helps support immune system health. 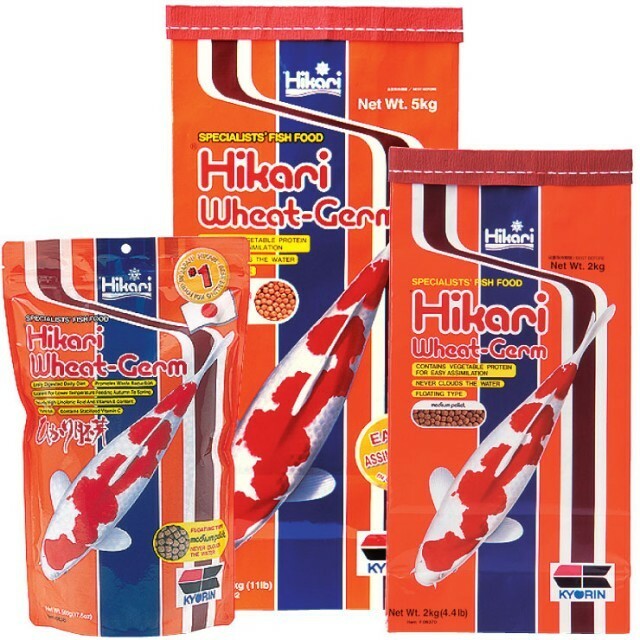 Note: Hikari® Wheat-Germ Formula contains higher levels of natural ingredients which may cause a slight change in color from one production lot to another. Rest assured because of our rigid quality standards each package meets our superior nutritional specifications. Regularly monitor your water temperature and adjust the amount and frequency of your feedings based on the temperature, water condition, number and size of fish and their activity level. Avoid over-feeding and always remove any uneaten food remaining after the feeding period. For 18-30°C (64-86°F) - Feed 2 to 4 times per day the amount your fish will completely consume within 5 minutes. For 5-18°C (41-64°F) - Feed no more than twice daily the amount your fish will completely consume within 5 minutes. For best results try to feed during the warmer part of the day. Below 5°C (41°F) - Do not feed your fish. Use as a daily diet for koi or larger goldfish when improved digestion is required.